One of the best gifts I received this past Christmas came from my future brother-in-law (it's only a matter of time ♥). A Barnes & Noble gift card and a nerdy girl like myself is good to go! So of course, a few days after Christmas I made a beeline for the fashion and beauty books. 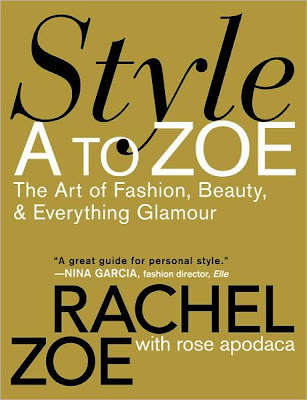 Nothing was really catching my eye until, lo and behold, I saw Rachel Zoe's Style A to Zoe. Now, I don't know about you, but I am seriously envious of the famous Hollywood stylista to the stars. With clients like Eva Mendes, Anne Hathaway, and Kate Beckinsale, Rachel Zoe is at the forefront of all that is glamourous. I have watched her show on Bravo from episode one, and I even have all of this past season on my DVR so that when I'm lacking inspiration I can quickly be guided back to fashion fantasy-land. Her book is absolutely a must. The gorgeous photography on its glossy pages is reason enough to run to Barnes & Noble. Her tips on putting yourself together for every occasion and event in your life is equally insightful. I dunno guys, maybe I'm just a big fashion dork. Maybe I'm just a hopeless dreamer. Maybe I want to own a closet full of stunners that I "just die" over! I read it in one night and am still skimming the pages just like I do with an old magazine that I can't put down. I keep searching for a paragraph, a single word that I might have hastily skipped over. But I can't. Nope, I've read all of it, cover to cover. It's that good. I absolutely LOVE her style! I can't tell you how jealous I am that you got a copy! i've looked at this in the store & wondered about buying it.. now i think i def will! hmmm i think i need that book! it would be fun to read! definitely one of of my favorite go to fashion books. ahh your love affair with ms. zoe. Do you adore this book? I need to pick up a copy. Oooh, I was going to order this from Amazon... glad you liked it!